For our last day in California, we decided to skip the wineries and spend the day in San Francisco. We were only about 50 miles away, so it was pretty easy drive into town. The Golden Gate was blanketed in fog as we rolled into town, but it cleared out as we entered the city. We drove straight along Lombard, and followed the street off the arterial so we could drive the car down the crooked section. Its fun to weave down the hill with the gaggle of tourists snapping your picture. We parked the car for the day near the waterfront, and took a walk around town. We had plans for the evening, as Sasha had one of her friends who also happened to be in San Fran, and they were going to meet for dinner. But for the daytime we just planned to walk about and see what was up. We started in Ghiradelli Square, since is was early enough in the day we were actually able to get into the little Malt shop they have there. usually, the line heads out the door to get in. We grabbed a couple of espressos and Sasha got a vanilla shake. The shop was very cute, with a display of traditional chocolate making in the back. It was fun to watch the machines churn chocolate while we waited for our drinks. Once done, we headed down the waterfront. We really had no specific goal, but set our destination for Pier 1, which was the converted Ferry Terminal. Last time we were in San Francisco it had a great series of little shops and restaurants, and seemed like a smart lunch destination. We just took our time to walk the piers, it was nice to see the various shops, fish-vendors, bakeries, etc. We checked out the marina behind the Aquarium, and I found a Carver Mariner like ours moored there. it was a newer model, and rigged for live-aboards. They had a new top on their boat that I was very jealous of. Ours is out of date and a bit trashed. We kept moving and continued our walk down the Embarcadero. Once we are and rested, we checked out the shops and headed across to the end of the California street Cable Car line. we caught one as we walked up the hill, and took it to the transfer over to the Powell street line. Sasha’s friend was staying at the same hotel we stayed at on our last trip, so we walked around the hotel area for a bit, and sat in the park for some coffee and to relax before meeting up at the hotel. Once Sasha went with her friend, Yulia and I caught the Cable Car back to Ghiradelli. It really is a cool way to travel across town. We passed the Lombard Hill on the way, and had a great view of Coit Tower. Once at the end of the line, we found a nice restaurant on the waterfront to relax at, with some live jazz playing. 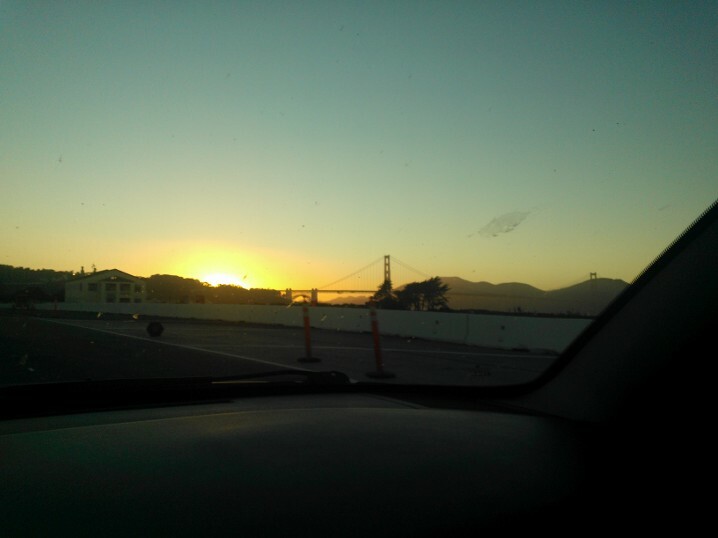 We just hung out until it was time to get Sasha, then we headed back across the Golden Gate. We had a big drive home in the morning, so we didn’t want to be too late at night. Yulia managed to get a Skype call to her brother as we drove, and they exchanged video of Moscow and San Francisco sites as we headed out. It was a fun end to a long trip. Time to head home.